This watch was given to my husband's Grandfather [ who was a doctor ] by a colonel in the US army whose life he saved when he contracted polio. They were both serving in the PIA [Persia and Iraq force] in1943-44 .Paul gave him about 14 hours of artificial respiration, mostly in an aircraft, in order to get him to an iron lung. It is 18ct gold but this is not the original strap. Hello Ruthieroth, welcome to myBulova. I love watches with a family story and this is a beautiful watch with a wonderful story. I hope your husband cherishes it. 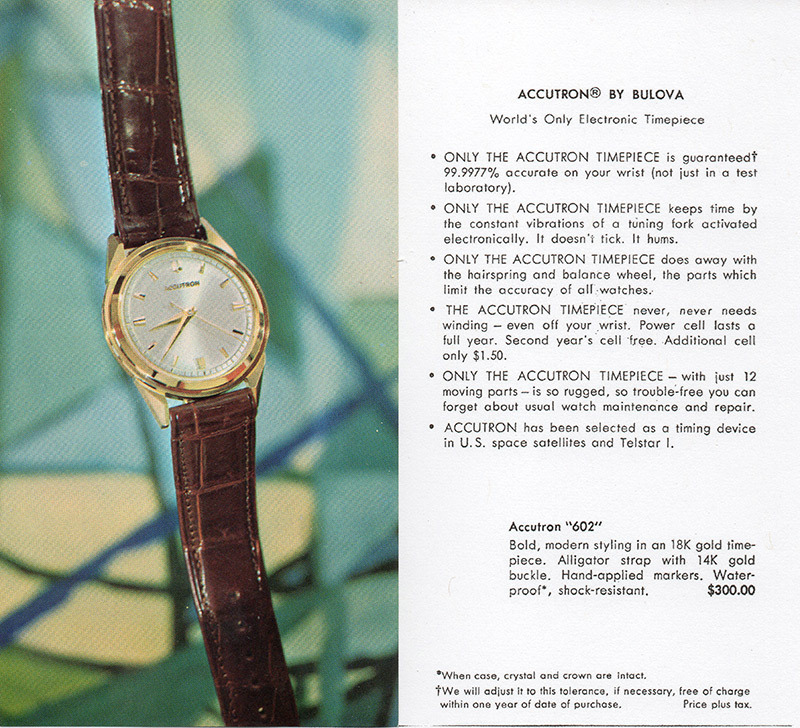 Bulova began selling the Accutron watch is 1960 and sold thousands of them over the years. We see many in stainless steel cases and some in 14k gold cases but a precious few in 18k. It's a real treasure. Here's an advert from 1961 showing your watch wearing an alligator strap. the odd thing is that it doesn't have a second hand. Could it have broken off, or were they made like that? Lovely to see an original advert and what it would have cost then. It is cherished but we are possibly going to sell it when we know more about it. This is an amazing set...looks like everything that originally came with the watch is there. It is truely wonderful to see an original first release 1960 Bulova Accutron, and a 18K gold version at that with all its original bits anb bobs. 1960 Bulova Accutron '602' is a great match, nice work Geoff. OK What does +1 mean? Apologies Ruth, as our main goal is to correctly identify watches and come to a consensus on the model name, we have a panel of members who cast votes once someone has suggested the ID. +1 is our way of agreeing with what a member has proposed to name a watch. As you can see, we have all agreed that your watch is an Accutron Model 602.